Tossing bean bags, moving like a dancer, and doing the hokey pokey might seem like silly exercises for adults, but Karen Peterson says they can be key to helping elderly people improve their coordination, prevent falls, and save their own lives. 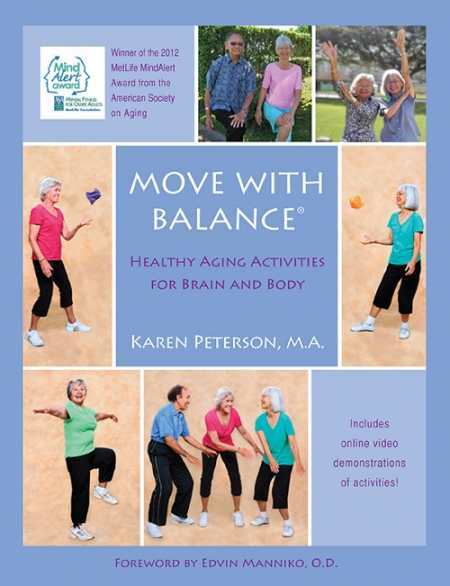 In Move With Balance, Peterson makes a good case for using these and other movements developed during her nearly thirty years of working in the field of kinesiology, the study of human movement, to help the aging brain and body. Elderly people often have problems with balance and coordination, and these impairments can be deadly. But simple exercises—doable even for frail seniors with limited mobility—can help make older people more flexible, give them better balance, and even help with mild cognitive impairment. This book, an excellent companion to Peterson’s program of the same name, gives tips not only to individuals but also to group leaders and professional caregivers. It spells out what a typical regimen looks like and outlines in words and pictures a variety of exercises that involve stretching, throwing balls and beanbags, walking with confidence and balance, playing childhood games, sensory integration, vision and balance, and rest and relaxation. Each exercise is explained in both a “why” section and a “how” section so caregivers and participants can understand not only how to complete a movement or game properly but also why it is important. For instance, an activity called “You the Dancer” is said to be beneficial because when participants imagine themselves as dancers, they move with more grace, balance, and coordination. Peterson also claims that using the right and left sides of the body at the same time “improves all brain processes, including those for motor skills, physical coordination, and cognition.” Without having taken part in the program, it might be difficult for readers to assess how useful the moves could be, but Peterson makes a compelling case for the quality of the exercises and the effectiveness of her program. The volume is quite detailed and would allow an individual to do the program alone or a caregiver to use the program with a patient or a group of seniors. Supplementary material at the back of the book describes the specific activities in more detail and includes a commentary on the brain processes affected by the exercises, which can be helpful in understanding the benefits of the program. The material is written by doctors and nurses, but none of it is from rigorous scientific studies. Move With Balance is a handy guide for seniors and those who care for them. Peterson offers what appears to be sound guidance to elderly people that encourages them to make deliberate moves to help improve their balance, cognition, and lives in general.